It seems a lot of the hype for the iPhone X being a massive seller hasn’t materialized. Consumers just don't seem able to stretch for the $1K price-tag for the marginal upgrades, which included face-recognition and tracking software, wireless charging, and its "bionic neural chip" that had impressive processing abilities, albeit also with many bugs and structure complaints. It is worth noting some analysts do theorize the iPhone X may still come in above estimates, based on various analytics tools, which would undoubtedly be extremely positive for Apple. 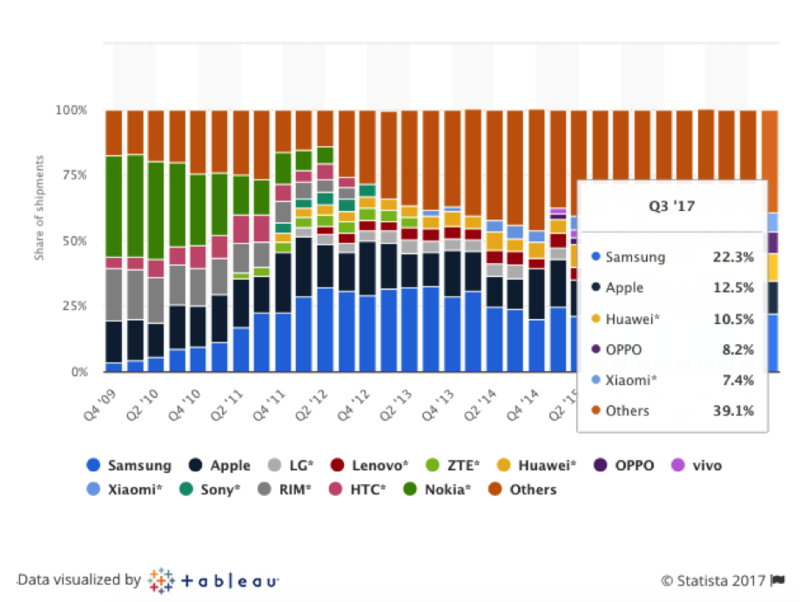 This would show that consumers are ready for the AI-capable smartphones Apple is taking an early lead in issuing. By jumping to the forefront of this technology at this time, Apple has entered the AI-capable smartphone market at a very early stage, and it will be poised to capture the growth in the market as it begins to explode over the next few years. According to projections, by 2020 over 1 in 3 smartphones sold will be AI-processing capable. 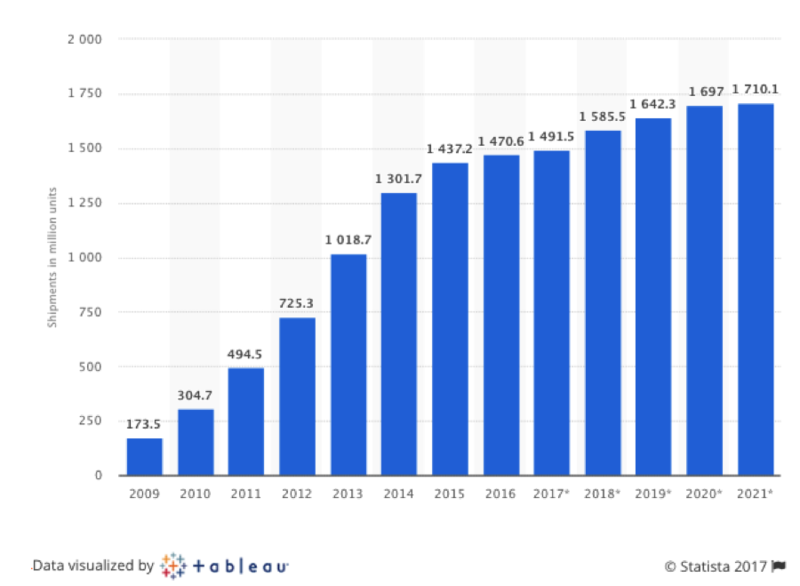 With over 1.697 billion smartphones expected to be shipped in 2020 that is almost 560 million AI-capable smartphones, up from essentially a nominal amount at the moment. Given Apple's current market share in the smartphone market, it is likely to expand its market share significantly once consumers begin transitioning over to AI-capable smartphones in the next 1-2 years as the AI-reliant software and AI-capable hardware become more ubiquitous. ​The iPhone X seems to have been marked at $1K less out of cost or margin reasons, and more out of perhaps a "shock and awe" strategy with consumers. Given Apple’s wide margins on iPhone’s, the iPhone X's profit margin (at a cost of $357, leading to a margin of 64% based on $1K retail) seems to be even higher than the iPhone 8's, which means that Apple has immense room to lower prices if needed, or it could keep prices high and capture immense margin profits as sales demand increases. Combined with likely cost decreases as chip manufacturers develop efficiencies as the AI-capable chip market really begins to take off, the AI-capable smartphones look very likely to be a major source of long-term profit for Apple. While LG and BOE are vying for Apple's OLED business for 2018-2019, Samsung Display will reportedly supply Apple with between 180 to 200 million flexible OLED panels for the iPhone in 2018, according to supply chain sources. That's around four times the amount it supplied this year, and translates into roughly US$19.8 to US$22 billion revenue at the supply price of US$110 based on calculations by IHS Market -- including the price of the cover glass and touch sensor. This year, Samsung Display has reportedly supplied around 50 million panels for the iPhone X. Improved yield rates at Samsung's A3 panel production lines are being cited as the main reason behind the display maker's decision to increase supplies to Apple next year. Earlier this year, the A3's yield rate was around 60 percent, but it stood at over 80 percent in the latter half of the year. As Samsung closes in on a 90 percent yield rate, they'll be able to churn out around 224 million 6-inch panels per year. The display maker had initially considered supplying Apple by investing in its A5 new lines, but could stick with its existing lines.